The first time we went here I thought "I would LOVE to get married here". I actually tried to get it for our wedding, but the date wouldn't work out. Oh yeah, and it is UBER expensive, but BEAUTIFUL nonetheless!! Despite a few uncharacteristically dreary San Diego days, the cherry trees are beginning to burst with pink and white blooms at the Japanese Friendship Garden in Balboa Park. 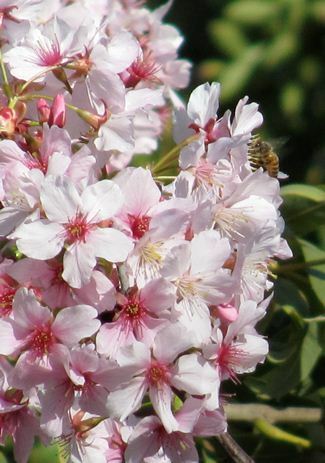 The Garden is home to more than 150 cherry trees and other flowering plants that will be blossoming through March, when the Garden’s fifth annual Cherry Blossom Festival will be held. During the festival, public visitors will also be able to view the progress of the Garden’s multi-year project to expand to eleven acres from its current 2.5-acre area. This year’s festival will be on Saturday, March 19, from 10 a.m. to 4 p.m. At the price of regular garden admission ($4 general, $3 seniors, military, and students) the event includes guided docent tours of the cherry trees throughout the existing site and expansion site, as well as Japanese food, arts and crafts, and cultural demonstrations. As part of Science Family Day, entrance will be free for children 17 and under with a paid adult.